Edmund Morrison Wimperis (1835-1900). Born in Chester, Wimperis studied wood-engraving under Mason Jackson, and worked as an illustrator for The Illustrated London News and other magazines. He gradually took up painting in oil and watercolour. From 1859 he exhibited at the most prestigious galleries, including the Royal Academy, the Society of Artists in Suffolk Street, the New Watercolour Society, the Grosvenor Gallery and the New Gallery. He was elected as a member of the Royal Institute of Painters in Watercolours in 1875, and then became its Vice President in 1895. His titles include some Cornish and West Country scenes, and he is believed to have been in Newlyn for a short period in 1881. 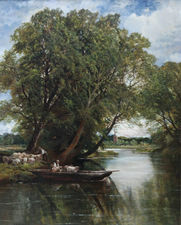 Flanagan finds him frequently painting along the Ouse in Huntingdonshire (1890s) and reprints two of his paintings in colour in her excellent book, Artists along the Ouse, 1880-1930.